You are invited to join us for a series of events on September 11-12 in recognition of World Suicide Prevention Day that will explore the interface between the arts and suicide prevention. Events include a gala kick-off dinner featuring Shelly Marshall's abridged production of "Hold Mommy's Cigarette", an exclusive screening of the documentary "The S Word", and a full day conference on September 12, 2017 which will highlight a new perspective and direction for suicide research and healing. 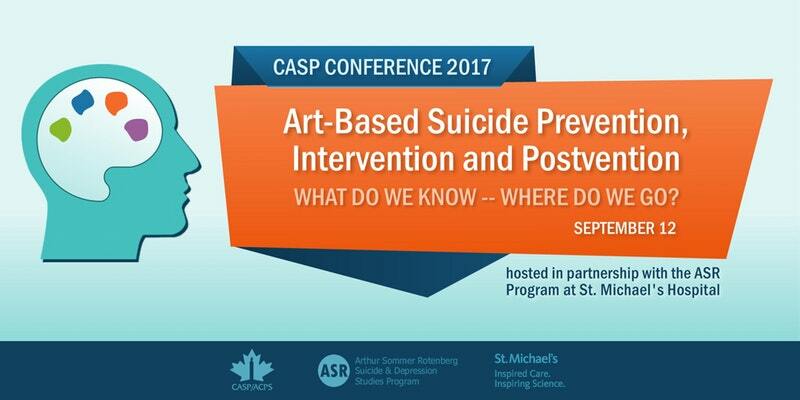 This conference on September 12th at the Li Ka Shing Knowledge Institute in Toronto will bring together multiple perspectives on arts based intervention, given that limited knowledge is currently available in this area. This invitation is open to researchers, front-line clinicians and therapists, survivors of suicide loss, survivors of suicide attempts and family and friends who have been affected by suicide and are interested in exploring the arts as part of the healing process.